108.41. I suspect this bocage may be a Patriotic Group bocage, but I am far from certain. Note also the cut-outs in the base. 108.42. Attributed to "Patriotic Group." Note the unique vicar. Vicars of this form are otherwise only found in christening and wedding groups. 108.43. 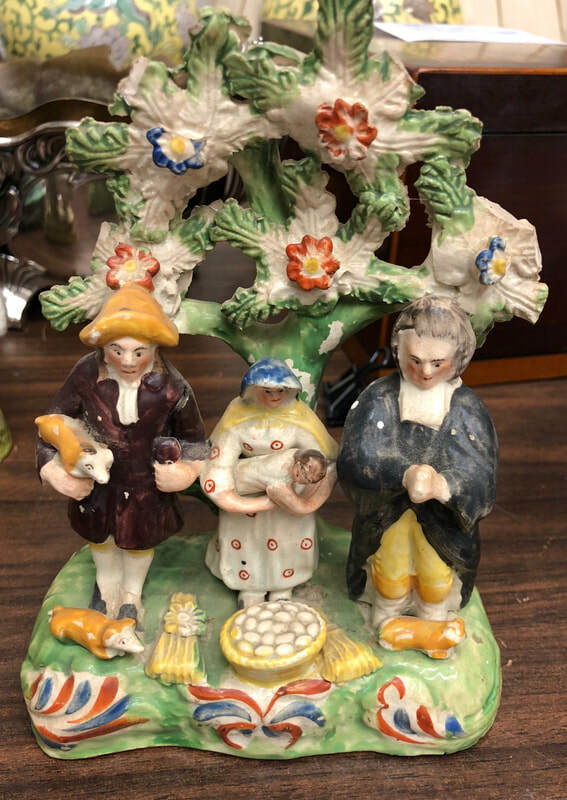 Courtesy Whitehall Antiques, North Carolina. 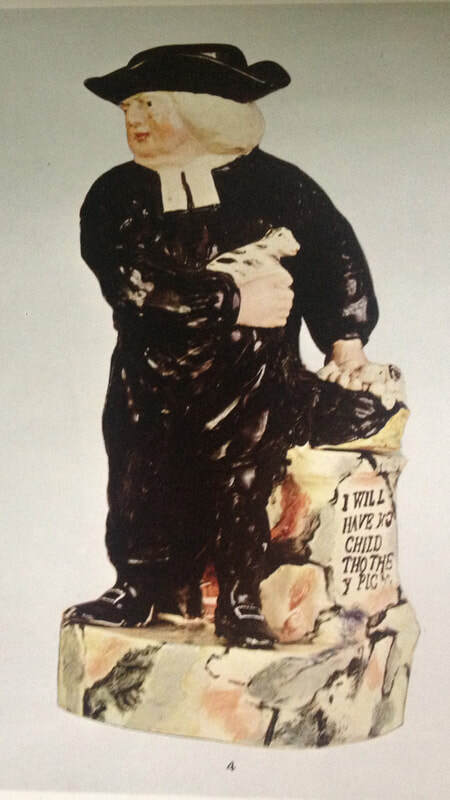 These figures are all very rare, and the enamel-painted vicar (shown last) is the only enamel-painted one I can trace. Did Ralph Wood make some of them? Hard to say with conviction. The modeling is of a high standard, so it is possible--even probably-- that they are his work. 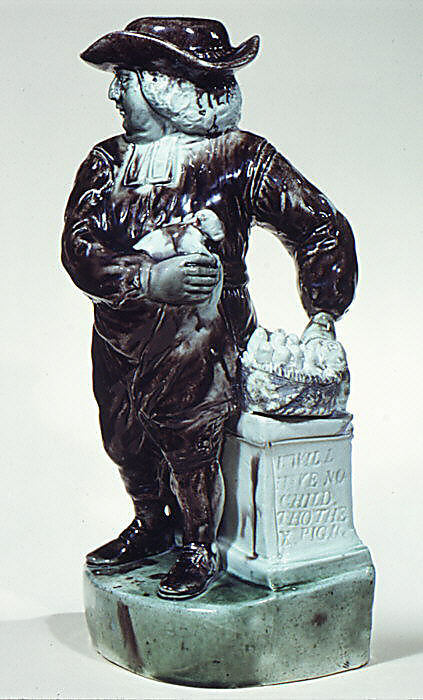 The first figure and the second are both decorated in colored glazes and modeled in the style of Ralph Wood. A large babe, is that not? 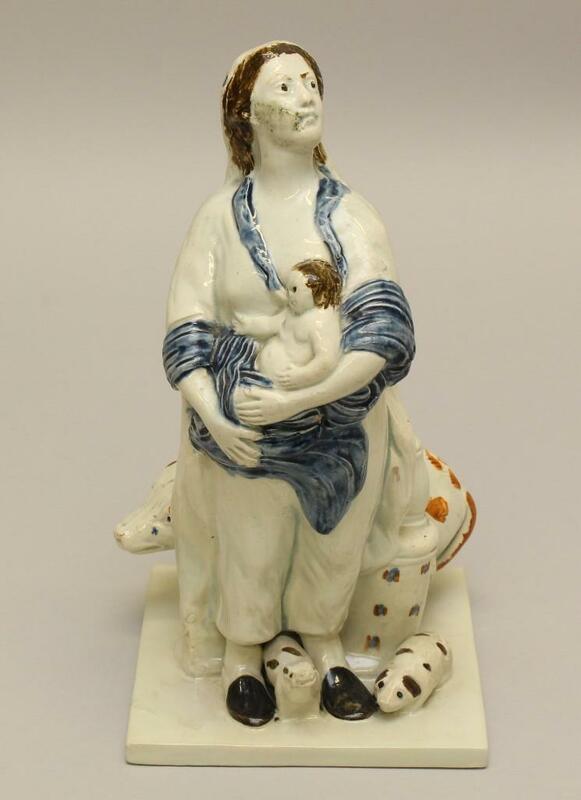 The third figure is very different and is, I think, decorated under the glaze. It is not of the caliber of Ralph Wood figures. 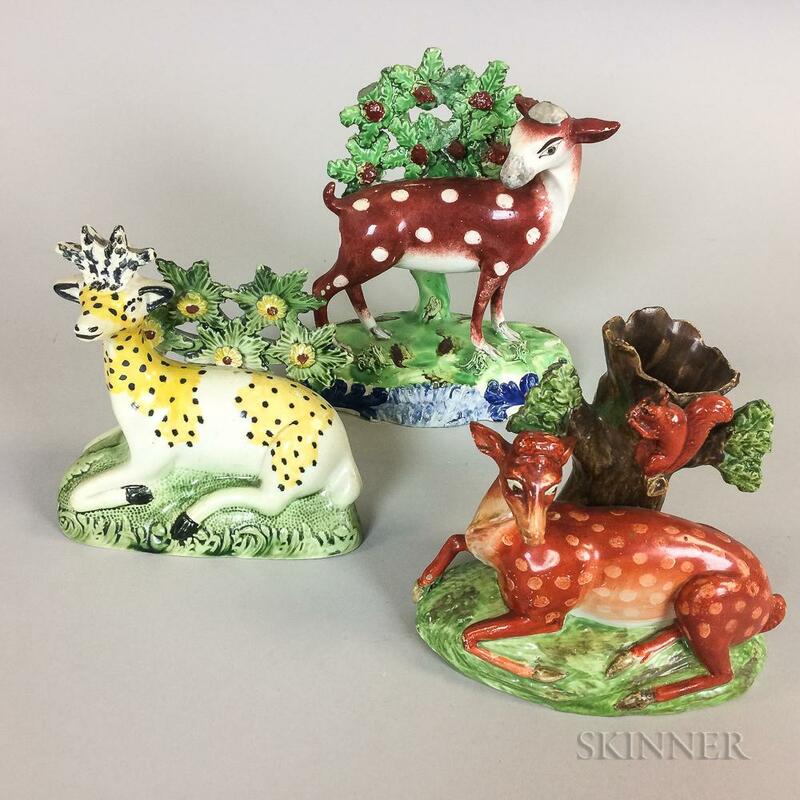 From "Mr. Frank Partridge's Collection of Ralph Wood"
These two examples, very much in the manner of Ralph Wood, are in colored glazes. Both are impressed on the side "I WILL HAVE NO CHILD THO THE X PIG". The vicar below is similarly impressed on the side. This time, it is decorated in enamel colors, and the decoration of the base and plinth alongside the vicar is not incompatible with a Ralph Wood attribution. 108.43. From the Captain Price Collection. The vicar below has been left in the white, with just the eyes picked out in color. There is no impressed wording. 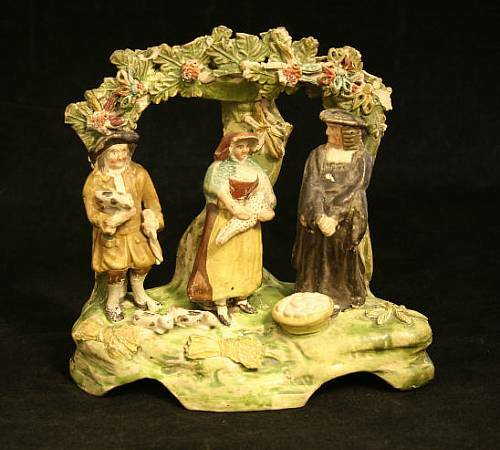 The figure may originally have had a removable crown to the hat. I suspect all the crowns on these figures are removable because the figure is also found as a jug. Courtesy Bob Moores. 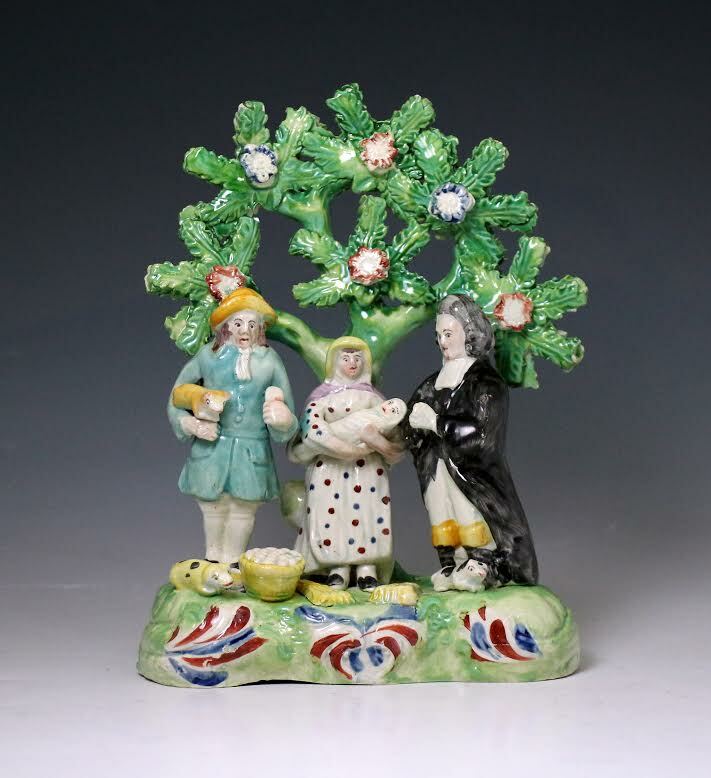 The vicar below is decorated under the glaze and uses different molds for the raised arm. Again, it is impressed on the side with the wording found on the first jugs. It seems cruder than the other examples shown here, but that may be because the photo is poor.